401k Catch Up Contribution - How to Use This Program? 401k Catch Up Contribution – How to Use This Program? If you feel like you’ve been putting off retirement savings for quite sometime and are inevitably approaching your retirement age, we have good news for you. IRS established a 401K catch up contribution program allowing individuals who have reached 50 years of age to contribute an additional amount of $5,500 to already existing maximum 401K contribution per year of $16,500. In other words, if you are 50 or over, you can contribute a maximum amount of $22,000 of pre tax income into your 401K account if your employer’s plan does not assume additional contribution limits. 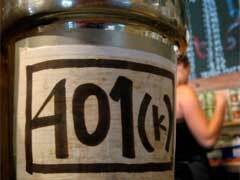 If you are employed by a smaller company that does not sponsor traditional 401K plans but offers a simple 401K, your 401K catch up contribution can not exceed $2,500 for individuals of age 50 and older. In addition, IRS has established an inflation index that can be used per their discretion to additionally raise 401K contribution limits to account for existing inflation in $500 increments. Your employer may or may not offer you a 401K catch up contribution provision since they are not obligated to do so by law. In order to take advantage of 401K catch up contribution program, talk to your 401K plan administrator to find out whether your company sponsors this provision. Aggressive growth mutual funds included as part of your investment portfolio can help you gain maximum yields in the shortest amounts of time that is especially necessary if you’ve been putting off retirement planning for various reasons. However, investing in aggressive growth mutual funds requires strong knowledge of market volatility and ability to predict potential market’s ups and downs.